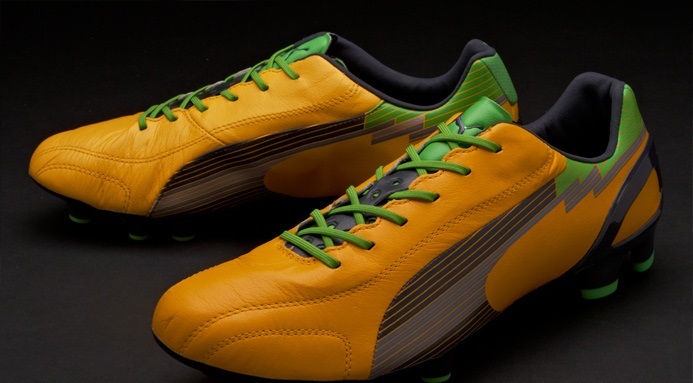 Created by Puma with only three things in mind, to be lightweight, flexible and offer the best possible fit. Weighing in at 193 grams, this evoSPEED boot is one of the lightest k leather boots on the football market. Designed with a super soft k leather upper which sculpts to the natural contours of the foot for amazing fit and feel. An evoAptoLast provides an industry leading fit while an external heel counter secures the foot. Puma's utilising of high-tech materials to minimise weight, and maximise flexibility and reactivity carries through to the outsole. A high-performance thermoplastic elastomer injected soleplate with conical and bladed mixed stud configuration provides great traction of firm ground surfaces.